Trevin Wax has compiled some statements on Christianity from both John Piper and N.T. Wright to provide some context for their debate on justification. I read this on Christianity Today and I am more confused than ever. With so much in agreement, and the big difference being what is meant by “works of the law”, I’m wondering what the big deal is. I’m not sure why people are so thrilled with N.T. Wright’s developments. N.T. Wright affirms the centrality of the Incarnation, substitutionary atonement and resurrection to our salvation. Salvation is received by grace through faith and repentance. Nothing novel or heretical there. But, such summaries as this tend to be reductionistic, so perhaps something important is being left out. As I read Romans and Galatians, I find something different than “ethnic badges” at work. Afterall, most of those in the Reformed community is baptism as the new “ethnic badge” which has replaced circumcision. Afterall, Abraham was justified by faith, so faith is not a new ethnic badge. So, I’m not exactly sure what the hype is about on either side. Since salvation is by grace through faith in keeping with God’s covenant promises in which He vindicates His righteousness through the atoning sacrifice of Jesus … it seems as though advocates of the New Perspective shouldn’t be all that excited since the church doesn’t seem to struggle with “ethnic badges’ anymore. I can see where some would be concerned that Paul’s arguments not seem irrelevant to us, but neither would Wright be considered a heretic. So I must obviously be missing something. It can’t just be a matter of emphasis and nuance. Is this thing just a bunch of smoke and mirrors? Much was made on Sports Talk Radio this morning about all the good Donald Fehr did as head of the MLB Players’ Association. Faye Vincent mentioned that he stopped the owners from busting the union, which is the reason there was not World Series one year. Players make a great deal more money these days thanks to the efforts of Donald Fehr. But the game, and particularly the fans, have suffered as a result of Donald Fehr’s efforts. The escalating salaries have meant that smaller market teams face a much more difficult situation. They cannot hold onto the talent they do develop through their system. Eventually, the best players will leave via free agency to cash in. This means a less enjoyable game for most fans. Teams like the Yankees, Red Sox and other major market teams will have the resources to compete for players. Teams like the Pirates have been reduced to Triple A++ since that infamous work stoppage. They develop players to be traded for prospects so big market teams can compete for championships. The spiraling salaries have also meant that the average fan often can’t go to many games. They are priced out of the tickets. A game becomes too expensive for an average family to attend in cities with competitive teams. Donald Fehr, in his quest to do what is best for the players, forgot that part of what is best for the players is families enjoying a day at the park, passing down a love for the game. Donald Fehr also fought drug testing on the basis of the players’ privacy. While that issue has inexplicably worked in the issue of abortion, it has not in the workplace regarding drug testing. He, with Selig, deserve a big part of the blame for the steroid era. He hindered the league’s attempts to have any kind of drug policy. Now the players will reap what he has helped sow. Fehr’s legacy is that he helped create bloated players’ salaries, and the biggest scandal in baseball after the 1919 Black Sox and segregation. All players are suspect now. They may not care since they have lots of money in the bank. But their reputations are tarnished, and they may not receive the ultimate honor in their sport- Cooperstown. If there is justice, Fehr won’t be found there either. I am not an official Trekkie. I saw most of the movies with the original cast, but preferred the Next Generation show to the original show. What I did appreciate was the bond of friendship that existed between Kirk, Spock and Bones. This became more prominent in the movies. Those movies were better than the Next Generation movies. A bit odd, isn’t it? I was excited to see a reboot to the Star Trek series (rather then delving into the continuing to deteriorate TV series). That J.J. Abrams was tabbed to direct was a good move in my book. But the question was how to reboot a series like Star Trek? J.J. Abrams and the screenwriters came up with a great idea- an alternative universe with all the same characters, but one in which not all will be as it was. Eric Bana plays the “best”villain since Khan. He is one ticked off Romulon miner who seeks to gain talonic justice (he thinks) against Spock. In some ways I wonder if he’s meant to represent a Muslim who becomes radicalized after his people are attacked. Just a thought since this is how some people think this has played out in the Middle East. This sets the stage for the backstory of how the crew of the Enterprise comes together for future adventures. Slowly the various characters meet one another to fill out the crew. The last is Scotty, who adds quite a bit of comic relief. Chekof’s attempts to master English is funny too. But Kirk starts off by alienating Spock. Apparently it was Spock who programmed the “no-win scenario” that Kirk beats. What they have done is tap into the Star Trek lore and came up with details about those events in the characters’ histories. This should add to the fun for those who have followed these characters. One of the more interesting details was the sub-plot of how Kirk supplanted Capt. Pike as Captain of the Enterprise. Pike was the Captain in the pilot, and then disappeared (surfacing in a later episode). But it is not all fun and games. There is a villain to be vanquished. Kirk and Spock chase him across the universe before he can complete his revenge by destroying Earth. In so doing, he tries to use the technology of the Federation, the Vulcans to be precise, against it. Huh? Again parallels to events in the Middle East over the last few decades come to mind. In the process they must learn to trust each other, and not give in to their own desire for vengeance against Nero for the pain he has inflicted on their families. During the opening sequence, and must of the movie, actually, something Jesus said kept coming to mind: “a man has no greater love than this, to lay down his life for his friends.” This is a theme that seems prominent. There was much to like about this movie, and I really enjoyed it- despite not being wild about all the casting choices, and some questionable acting performances. Still, much better than any of the Next Generation movies, and most of the original movies. This could be a very promising series of films. The final chapter of Total Church covers the idea of success. After a few less than stellar chapters, they end the book with a home run. Pastors and congregations often fall prey to false (idolatrous) views of success. Those idolatrous views often assume control, OUR control over outcomes. We do have control over our choices and decisions, but we can’t control how those turn out. So they suggest three shifts in outlook. First, from larger churches to more churches. We often measure the success of a church by how large it is (or isn’t). There are many factors that go into how large a church becomes (faithfulness to the gospel, or lack there of an important one). They suggest we change our model to more churches- measuring growth in terms of starting new healthy gospel communities. Yes, this could become an idolatrous numbers game too since we are sinners prone to pride. But smaller churches (or many mulitplying small groups) provide an environment where we can obey God’s call to love one another in various ways throughout the New Testament. Smaller communities are more likely to maintain gospel fidelity (greater accountability), as well as work out how the gospel has application to the various circumstances of the members. Second, a shift in leadership from performance to enabling. It is easy for pastors to get stuck in the performance trap, and many a congregation enables or demands it. In a smaller community, the pastor’s flaws are more obvious because he is known better. And you also see how the gospel is at work in him. Biblically, the pastor’s role is to equip the saints to do the work of ministry. Here is the rub, in many small churches it often falls to the pastor to do most ministry. It can be difficult to find people to equip. This is a challenge, but not an insurmountable one. As someone in the midst of looking for a new call, I find many churches focused on performance rather than character. Committees can want you to sell yourself rather than demonstrate character. We need to rediscover the biblical qualifications for office- all but one is about character! The third shift is from a theology of glory (success) to one of the cross (suffering). I’ve been preaching this for years, and it is a tough sell. But people want to see how to suffer/fail/lose well. By well, I mean finding the grace to persevere and not be crushed by suffering and disappointment. Luther took notice of what was happening in the Letters to the Corinthians. Like the Corinthians, the church of Rome had embraced a theology of glory. It was about power, success, honor and more. The American church struggles with this as well today. Paul preaches a theology of the cross, embracing suffering along with Christ. The community is one that embraces broken people, instead of being image conscious. It was where this mindset prospered in the early church that the church prospered. They took in the orphans and elderly, and the gospel made great in-roads. But when the shift to glory took place, the gospel was obscured. Overall this is a very good, profitable book. Not everything they say may “fit” every congregations situation. But the overall focus they want people to embrace is a good one, and an overdue one. As a small church pastor, we failed to satisfy many a parent’s desires when it came to children’s programming. This is the plight of many a small church. This is the subject Chester and Timmis address next in Total Church: A Radical Reshaping Around Gospel and Community. They begin by exposing the problem they are having in Great Britain. Despite the focus on youth work, many leave the church upon reaching adulthood. It seems as though the growth of youth ministry in England has not produced any significant, positive results. They wonder how churches can make a better impact for the gospel. Rather than siphoning them off in a youth-focused ministry, they seek to integrate them into the gospel community. There they are exposed to real-life Christianity. They are also connected to more mature Christians, deepening their relationships with the whole congregation instead of just the youth worker(s). They have also witnessed similar problems with churches utilizing children’s church. Though it sounds as if those churches still had children’s church for teens. If they are not integrated into the rest of worship earlier than that, then it is no wonder they leave when they graduate. At Crowded House they integrate the kids into the gospel community as well. They seek to maintain “dual fidelity to the gospel word and the gospel community.” They want the kids to see people taking the Bible seriously and seeking how to obey it. Some of their groups break up into application groups that are age appropriate. I agree with this, yet I have also led family-oriented small groups. The kids were a huge distraction. The reality of the situation is that we don’t have to embrace a false dichotomy: either total integreation or total separation. We can avoid the extremes to find a workable solution that makes sure the kids and youth are consistently exposed to the gospel (not moralism) and the gospel community, yet not distracting to the adults. Even in the family, the kids often go off to play or study alone while adults spend quality time together. This brief chapter left me going “yes, but” quite abit. I embrace the ideals, but have not found their solutions as helpful as they have. This morning I had to give my first-ever children’s sermon. The text was 1 Kings 18 (the subject of their children’s church lesson). To prepare I broke out my copy of Faith in the Face of Apostasy: The Gospel According to Elijah and Elisha by Raymond Dillard. The cycle of stories in 1 & 2 Kings about these two prophets are among my favorites in the Old Testament. Prior to his death, Raymond Dillard did some lectures at RTS Orlando that would later be a part of this book. It was the first in the Gospel According to the Old Testament series. The series takes a biblical theological, gospel-centered approach to the texts. I really enjoy this series. And it all started with this book. It was the first one I read, prompting me to keep an eye out for new installments in this series. I think I’ve been disappointed only once. This series has been a series that has instructed me in what it looks like to take a redemptive-historical, gospel-centered approach to Scripture. That simple means to keep each text in the context of the whole, connecting it to the story of redemption which culminates in Christ. Understood this way, Elijah and Elisha are historical types of Christ. Their ministry is a reflection of his earthly ministry. In each chapter Dillard brings us from the days of Elijah to the present through the work of Christ. Each chapter has questions at the end to help you process and apply that portion of Scripture. It is my hope to eventually use these materials for a sermon series or small group. I want my congregation to learn the redemptive-historical approach to the Scriptures and this is one great way to teach them. 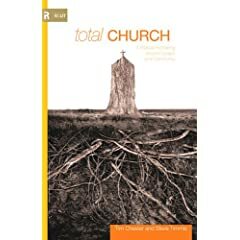 As we move through Total Church, the authors discuss theology and apologetics in relationship to mission and community. Part of what they are reacting to here is the form of systematic theology that is disconnected to biblical theology. Not all systematic theology is disconnected in this way. But too much is. As a result they argue for a Word-Centered theology. We are to recognize that God took the initiative of revealing Himself in His Word. This keeps theology from being speculative, but rather bounded by God’s revelation. We seek to understand what he has reveal. But we should not try to say much more than he says. I say “much” because we can draw some good and necessary deductions or implications from the Word. But to move beyond that is to become speculative, developing a human theology. Our theology is not to be academic in nature, but the fruit of engaging Scripture and submitting ourselves to it. John Frame talks about how we have not properly understood the text unless we have applied the text. This, I think, is what they mean by practical theology. I find myself disagreeing with the notion that it must be shaped by a missionary hermeneutic. This is what I mean, and I’ll put some cards on the table. In God-Centered Biblical Interpretation, Vern Poythress reminds us that Scripture has many applications and perspectives. This is due to God’s nature. If we keep God and the gospel at the center of our interpretative process, we will see its application to worship, mission, sanctification and more. Each of us tends to gravitate to a particular interest, and seens Scripture in that light. But the same texts also speak meaningfully to other areas as well. We should not embrace a reductionistic hermeneutic no matter how important that subject (Scripture teaches a Christ or gospel centered theology from which all else flows. I do agree with Chester and Timmis that we need to do a better job of explaining and applying what Scripture does teach about the important role of mission in the identity of the church. In this way, one of the actions the application of Scripture will lead to is mission (as well as maturity in Christ, worship, etc. ).